What’s the worst Christmas gift you could give someone? It would have to be a non-human primate or a big cat. Images of people cuddling cute baby chimpanzees, slow lorises or tigers can lead to false perceptions that these animals make great pets. But buying these pets encourages the illegal pet trade. Chimpanzees in particular make terrible pets - they destroy everything and are often much stronger than humans. They belong in forests or other wilderness areas, with members of their own species. Yet, a dilemma faces scientists and science communicators who work with animals and conservation. In order to widely publicise issues related to conservation of wildlife, media editors or producers typically request images of the scientist (including me) or communicator interacting with animals. Without explanatory text, these images may lead to people wanting exotic pets because they give the false impression that they are “cute”. Without these images, an editor or producer may not run with the story, or a sponsor may lose interest in funding a project. 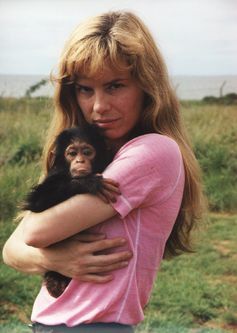 The author with an orphaned chimpanzee infant who needed constant human care for the first few months after she was confiscated by authorities. As an adult living with other orphaned chimpanzees, she is HUGE and many times stronger than the author. Zoos constantly get enquiries from people wanting to buy monkeys or other exotic animals as pets. Worse still, people may want a pet chimpanzee, mistakenly thinking that they are cute and funny based on their “antics” in advertisements or appearances in sitcoms or movies. Popular media portrayals of chimpanzees have been shown to distort public perception of this endangered species and hinder its conservation. When humans smile, we often show our teeth. When we see an advertisement or movie with a “grinning” chimpanzee or orangutan, it is usually a fear grimace. Young apes in the entertainment industry are trained to grin, sometimes through the use of cruel methods. 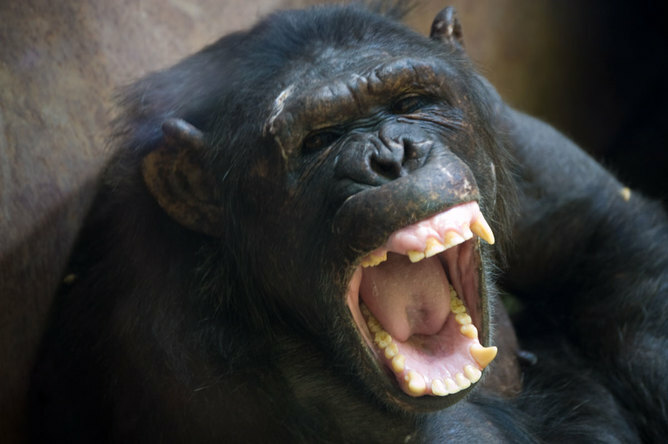 When our “hairy” relatives laugh, they have a play-face, which is usually open mouth with teeth covered by their lips. Why Do Non-Human Primates and Big Cats Make Bad Pets? Anyone who has seen chimpanzees in the wild would be left in awe of their strength and intelligence, rather than perceiving them as “cute”. Similarly, anyone who has studied or worked with big cats, such as tigers, would not want one as a pet. Both primates and big cats require special care, are long-lived intelligent species, very destructive, and are much stronger than humans. Primates, in particular, can share deadly viruses and diseases with humans as a result of our genetic closeness. Often people don’t realise how big adult chimpanzees are, since most of the “entertainment” chimpanzees are youngsters. Once these pets are fully grown, and often unmanageable, in the United States they are likely to end up locked up in basements or cages, or in private zoos. It is only when a person is mauled or a potentially dangerous animal escapes that the issue of inappropriate exotic pets arises. In Australia, tighter laws and regulations than in the United States make it difficult to secure a monkey as a pet. But species are kept illegally, and reptiles, fish and birds are smuggled into Australia. These exotic species pose threats to the Australian environment, economy and public health if they become future “invasive” species - either because they escape, or are released by owners who no longer want to keep the pets. Non-native or exotic species may seem more interesting, exciting or trendy. But they need special care and diets, and the cost of maintaining them for many years or even decades may lead to owners simply abandoning their pets by releasing them into the environment - just as people in the United States do. In one raid of a home in California in 2003, 30 adult lions and tigers were found dead, as well as a freezer full of 58 dead cubs. The Wildlife Trade Monitoring Network (TRAFFIC) monitors illegal trade in animals. The small and “cute” slow loris, a primate, is threatened by the illegal pet trade throughout South East Asia. Like all primates, slow loris may bite, and animal traffickers may pull out their teeth, which can lead to infection and death. If these toothless animals are confiscated by authorities, they can’t be released back to the wild, as they need their teeth to survive. The illegal animal trade exists and flourishes because people want exotic pets. It threatens endangered species, such as chimpanzees, gibbons and tigers. Thousands of Indian Star Tortoises are illegally smuggled out of India, Sri Lanka and Pakistan every year to supply the exotic pet trade in South East Asia. In Malaysia, imported sugar gliders are popular as pets, with a growing concern that wild populations in Indonesia and elsewhere may soon be at risk of extinction. In October, the United Nations Convention against Transnational Organized Crime recognised illegal trafficking in wildlife as a new form of transnational organised crime, with links to high levels of violence and corruption - just like the drug trade and human trafficking. Love alone is not enough to save the species we share our planet with. It must be a love that is compassionate and respectful to the animals we want to save. Most of the time, that means leaving them alone - without touching, feeding or owning them. 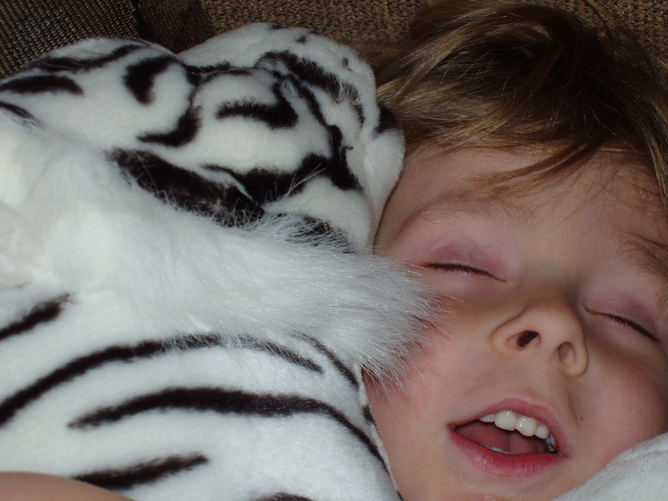 As Christmas approaches, and children everywhere ask Santa for a cute baby chimpanzee or tiger, let Santa please deliver a soft toy version instead - with proceeds going towards conservation of their wild counterparts!